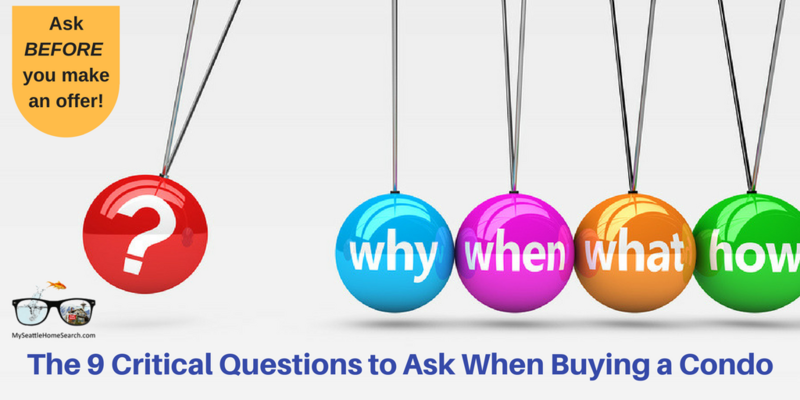 Here's a list of the most important questions to ask when buying a condo. And make sure to ask ALL of them! #1: What are the monthly HOA dues and what's covered? When you buy a home, you are responsible for all your own repairs plus covering the cost of them. When you own a condo, you will be required to pay monthly Home Owner Association (HOA) dues. These monthly fees can vary a lot from one development to another and just like property taxes, they always go up over time. You'll want to ask what you are getting for that chunk of monthly money. Usually, items like common area maintenance, earthquake insurance, and garbage will be covered but you will probably have to pay for your own electricity and water. It's a good idea to ask how much the dues usually go up each year. Part of your monthly dues also goes into a reserve fund that's used by the HOA for repairs and upgrades. When determining how much you can afford to buy, make sure to take into account the HOA dues. Most online mortgage calculators don't include them in their calculations. 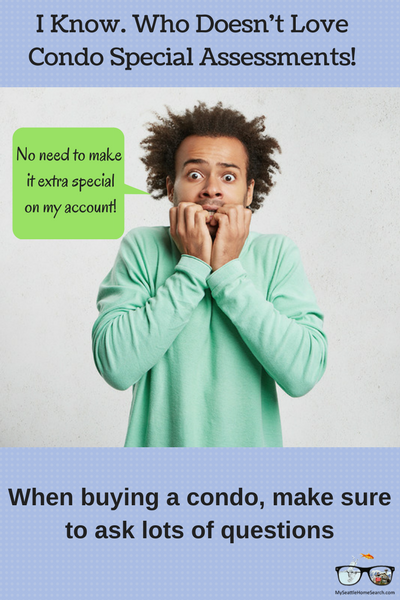 #2: is there a condo special assessment? A condo special assessment is the bane of condo owners and happy are those who don't have to endure them. Special assessments are levied on all the owners of a condo development when the HOA has insufficient funds to cover the cost of needed repairs and upgrades. For example, say Crystal Springs Condominiums needs a new roof and the exterior is peeling and needs to be repainted. It's going to cost $100,000. However, the HOA only has $20,000 in its checking account. Well, the money has to come from somewhere and that somewhere is you, the condo owner! The HOA will raise the required funds by either asking all the individual owners to make a one-off lump sum, single payment, for example. $10,000 or divide that $10,000 over say 3 years with increased monthly dues. That can be difficult for many of the owners to come up with. Sometimes, it can be a lot more than $10,000. Are there any current or upcoming special assessments? What is the special assessment for? Is it a one-off payment or split over a few years? When was the last one, how much was it and what did that cover? If the special assessment is already in place and requires a one-off payment, then you can request that the sellers pay for it at closing from the net proceeds of the sale. The problem is when the assessment is not in place yet and will be instigated sometime after you have taken possession of the home. You should be particularly wary of situations where the amount that each owner will have to pay has not yet been decided by the HOA. You could be in for an ugly house warming gift! 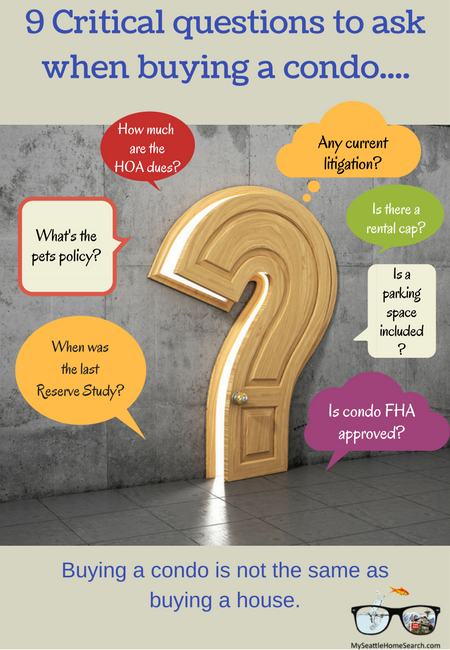 #3: Is the condo development FHA-approved? Condos are a good foot in the real estate door for many first time home buyers, many of whom rely on FHA loans. These loans are popular because they only require a buyer to have a 3.5% downpayment. If you are relying on one of these loans you will need to ask if the condo development is approved to accept FHA loans. Some developments will be but many will not. If you are relying on an FHA loan, your condominium options will probably be more limited compared to if you were using a conventional loan with a bigger downpayment. For a condominium to be FHA-certified, it must meet certain FHA loan requirements. These include a minimum percentage of units that must be owner-occupied and a set maximum on the number of owners who are in arrears on their HOA dues. The HOA must undergo a certification process in order to get FHA-approval. Unfortunately, for some HOA's they just couldn't be bothered with the hassle of going through the process. It's a little short-sighted since they are reducing the saleability of their homes (assuming they would meet the FHA criteria). #4: Is there a rental cap? This is an important question to ask when buying a condo. When you own a house, you can do as you please, run off to Antarctica for 2 years and rent out your home. When you buy a condo, however, you have to abide by the rules and regulations of the association. A rental cap is the maximum number of units in a condo development that be rented at any one time. All other units must be owner-occupied. For condominiums with caps, 20% is a common limit. If the ability to be able to rent out your condo is important to you, then it is critical to inquire about the HOA's rental policy. If the condominium is already at its cap, then you will not be able to rent your unit. You will have to go on a waiting list. Last in goes to the bottom of the list. If you suddenly need to relocate for a new job, don't have enough equity to break even if you sell and can't rent your unit, then you are in a bit of a pickle. Condo developments with no rental caps can be appealing but there are pros and cons. The peace of mind and flexibility of knowing you can rent your condo at any time is nice. These kinds of condos are attractive to investors who want to be able to rent out the condo. They have no intention of living there. However, without a rental cap, a large number of the units may end being rented and the place can start feeling more like an apartment complex rather than Happy Shiny Condominiums. No offense to renters, but they probably have less of a vested interest in the place than you, an owner, would. A lack of a rental cap can be a negative for some condo buyers who are escaping years of renting. #5: What's the condo association's pet policy? We love our pets and we'll do anything for them. But pets can't speak so you'll need to talk up for them. The last thing you want to do is get the keys to your new condo and then discover Rex and Fido are not welcome. And as for that 10-gallon piranha aquarium... time to advertise it on Craigslist! Different condominiums will have different rules when it comes to pets. Some development can be like zoos with little or no limits while others will have very strict rules. Some will allow zero pets, some will allow just cats and some will allow cats and dogs. For those that do allow pets, the HOA will usually set a limit on the number of each, the size of the pets (under 50lbs for dogs is common) plus they will usually not allow certain breeds considered to be more aggressive like pit bulls. And yes, you will always see a rule saying "No Farm Animals". Alrighty! So now cows for you then! So if your Fido is 90lbs of pure slobbering lovin' and the limit for Del Boca Vista Condominiums is 50lbs, then it's time to look for someplace else. And yes, those annoying yapper, sit-on-my-lap-while-I'm-driving dogs will dominate condoland. There is no justice! #6: Does the condo come with designated parking or any parking for that matter? Especially in cities, parking is a precious commodity. Having your very own designated parking spot is a thing to be cherished. Driving around in circles on a rainy night looking for parking is way overrated! Never assume that the condo comes with an allocated parking spot. Ask! Sometimes on the online listing it will list the number of the parking spots if they go with the condo. If you need more than one parking space, ask if you can lease a second spot from an owner who's not using theirs. In some condominiums, it might be a first come, first served set up and won't have enough parking spaces for everyone. If all the spaces are gone, will you be able to find parking nearby on the street? If you live in the middle of a bustling city like Seattle and you own a car, then you most definitely will need a designated parking space. #7: Is there any current litigation? When purchasing a condominium, you want to avoid ending up with one that is embroiled in some expensive, drawn-out litigation. Then most common of which is where the Home Owners Association is suing the builder. Most new construction condos come with a 10-year builders warranty and warranties are only as good as the willingness of the builder to honor that warranty. The classic items that will fail first are the siding, the windows, the roof and the decks. They are exposed to the wind, rain, and elements and any shoddy construction will be quickly exposed. So if the builder wins the case or weasels out by declaring bankruptcy, then who's going to pay for all those critical structural fixes? Yup, it's you and the other less than amused owners. Asking about any current or upcoming litigation is critical when buying a condo. Also, it's good to ask about any previous litigation and see if the issues were addressed properly. #8: When was the last time a RESERVE Study was done? Condo buildings, like any home, always need maintenance, repairs, and updates. And that costs money. So how does a Home Owners Association know if they have sufficient cash on hand to be able to take care of unexpected repairs plus have enough to address big known repairs down the road? Answer: they hire an independent company to conduct what is known as a Reserve Study. The company goes over/audits the condo building and property with a fine tooth comb and then writes up a large report. This is done every few years. Reports that are more than 5 years old are outdated and unreliable. The Reserve Study report will come back with a list of all the repairs that need to be addressed NOW. It will also list all the expected repairs and upgrades that will need to be addressed over the next 5, 10 and 15 years. For example, the exterior will need painting in 4 years but the sprinkler system needs to be brought up to code ASAP. The report will then have some scary math showing how much all of this work will cost and compare it to how much money is currently in the HOA's kitty. If there's a big discrepancy between the two numbers, then the auditor will recommend that monthly HOA dues be increased, or worse, instigate a special assessment to speed up the process. A well-run condo association will have healthy financial reserves and be able to cover the recommended updates without having to start tapping the individual owners. A badly run association will probably be scrambling to make up the needed funds and likely have a history of one special assessment after another. These are the condominiums you want to avoid or seriously reconsider before making an offer. #9: The condo buying catch-22: Is a copy of the Resale CERTIFICATE available before I make an offer? Many of the answers you seek lie within a voluminous $300 PDF known as the Resale Certificate. The sellers must provide you with a copy as part of the condo purchase process. The Covenants, Conditions, and Restrictions (CC&R). A copy of the most recent Reserve Study. Copies of the meeting minutes (always a good source for the latest issues, infighting and petty grievances). All the juicy information you need is usually contained within the Resale Certificate. A buyer's offer will usually be contingent on approving the contents of the wordy document and a review of the HOA. The problem is that the certificate is usually only ordered by the seller once they have accepted an offer. Why? Because the seller doesn't want to spend $250+ on a document that might not be needed if no one makes an offer on their condo. Once it's ordered, it can take up to 10 days to be delivered to the buyer. It's one of those classic waiting periods when buying a home. In the meantime, the buyer is expected to do their condo inspection while not knowing if there is something in the Resale Certificate that will kill the deal for them. In a hot real estate market like Seattle where almost every home sells, I recommend that the seller orders the Resale Certificate BEFORE going on the market. The certificate can then be made available to any interested buyers before they decide whether to make an offer. Plus, in a strong seller's market, a buyer will likely waive the HOA review contingency to strengthen their offer. Some final thoughts on the 10 Critical Questions To Ask When Buying A Condo. Buying a condo requires an added layer of investigation and is a lot different than buying a house. Use the list of questions above to find out early in the process if a condo will work for your particular needs. Then more answers you can get up front the better. Make sure your Realtor works for their commission and get busy ferreting out the answers that will help you make the right decision. Good luck! Here are some additional helpful condo buying resources from other real estate professionals. The above article "The 9 Critical Questions to Ash When Buying a Condo " was written by Conor MacEvilly. Conor is a Realtor living in the Ballard neighborhood of Seattle. He works with both home buyers and sellers in the greater Seattle real estate market and on and on the Eastside in neighborhoods like Redmond, Bellevue and Kirkland. would ask if they are planning for any special assessments.How old are the roofs and how old is the paving. These are both high ticket items and should be looked into beofre some purchases a condo.